Last May, George and I decided that we would try to attract hummingbirds to our backyard. We hung a red geranium with large luscious looking blooms and a red plastic feeder full of a sugar mixture that we boiled and cooled. Then we waited. And waited. One morning, I looked out and there was a nice big hummingbird, who took one sniff on our sugar water and went flying back from whence he came. I ran out, thinking that our sugar water must have been full of bees, or mold, or diluted by rain water. We boiled more water, added sugar, cooled it on an ice water bath, and ran out to the feeder with it. We didn't see another humming bird for a month! Then, one day I looked out, and the feeder was on the ground. The red geranium was there, and a hummingbird came, took one sniff of that foul smelling plant, and flew back into the woods. I ran out, got the feeder off the ground, washed it, filled it with nice syrupy sugar water and hung it back out. I never saw another hummer for weeks. The day before yesterday I looked out. The hummingbird feeder has been there, but rather neglected, with the old sugar water and the colony of bees that have found it a nice home away from home. 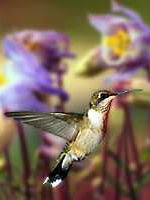 A big FAT hummingbird came, sniffed at the flowers, ignored the feeder completely and flew away. Gah! I have given up. I think the first mistake we made was buying that big bunch of beautiful red geraniums. They look great, but hummingbirds hate 'em, and they probably smell bad and taste worse. SO, next year I will buy a different bright red plant, something yummy and sugary, and hang that on the post with a sign; "Don't give up on us, please COME BACK!" 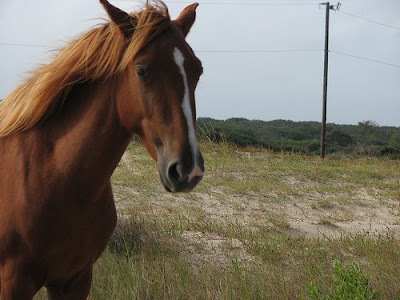 Can you believe this horse is wild? What a beauty. 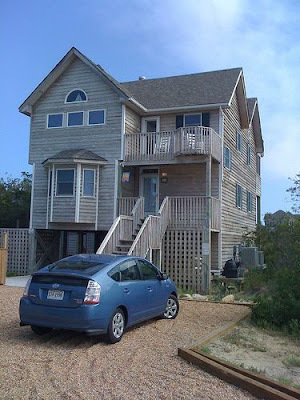 Michael and Michelle just returned from a vacation on the Outer Banks. They missed Hurricane Hanna by inches, and then were lucky that Hurricane Ike went the other way. We heard on the weather channel that for hurricane frequency the Outer Banks of North Caroline are 2nd. Florida is first, of course, sticking out there in the Gulf. The Outer Banks are someplace I have always wanted to see. I am hoping that George and I can go there this year some time. Michael said there was plenty of room for all of us. Wouldn't that be fun?? 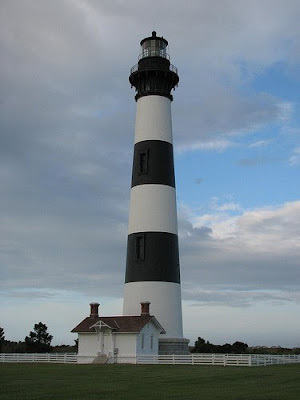 When I was a little girl I lived in the hot dry plains of Oklahoma, and I would see pictures of light houses and thought they were so beautiful. To me they were beacons of light in a wild sea. I had no idea what the ocean was like. I thought that the ocean had huge waves crashing up onto the shore all the time. I didn't know that oceans can be quiet and flat and calm. I thought they were always angry and gray with big white capped waves. The truth of course is a little less exciting but there are enough crashing waves and storms for the coasts to need lighthouses, and I am fascinated by the painted stripes on these two. 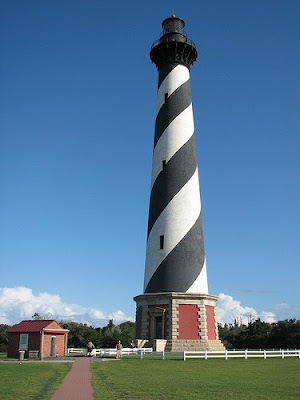 They have to be the most beautiful lighthouses in the world. I am included a wonderful picture of a wild horse, and a picture of the house where Michael and Michelle lived for a week without us. Today is Sunday. I woke up and went downstairs, made coffee, and started revamping my beading work area. 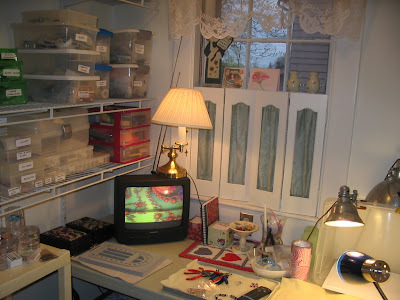 It is a tiny beading studio which used to be a breakfast nook in our kitchen. Since the nook was too small for both George and I and a round table, it was rather a useless area. We took out the round table and chairs and added a long table across the area. He added shelves on the left. Looking back, it would be nice to have shelves on the right as well, but always room for improvement later. We added a small television hooked up to cable, a small air conditioner, two lamps and an Ott Light. There is a window, which is wonderful to have. I have put up some paintings and added all my beads which are organized in plastic boxes I buy when they are on sale at the craft stores. I have about 35 boxes of beads. It is amazing to me that some of these boxes have probably a hundred dollars or more of silver, a thousand dollars worth of lampwork, and all kinds of other beautiful Swarovski crystals in every color, antique lucite beads,an array of gold and silver clasps, buttons, wire, sterling silver wire in different guages, cord, fasteners, glue, silk thread; well you get the idea. I have an inventory to be proud of and I know where every single bead is. I can put my hands on what I want pretty easily. Sometimes it takes me more time to find the right elements than to put the piece of jewelry together, but that is not surprising. It is the vision first, the hunt second, the design third and then the craftsmanship needed to put it all together well now so it doesn't fall apart later. George went to Belfast, Maine today to see an air show with the Blue Angels. I elected to stay home and spend the day renewing my creative energy. The beading table is all organized and the beautiful silver that I bought at the bead show yesterday is all put away. All that feels really good. Now it is time for the creative part to start. 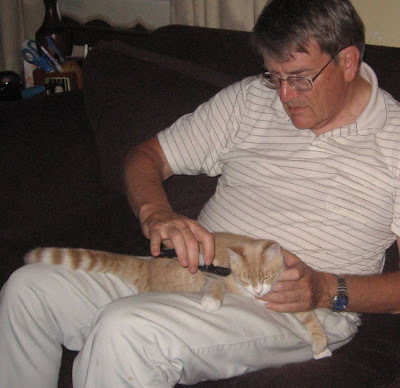 George and I continue to be crazy about our kittens. They are growing fast and we have noticed that their coats are really getting beautiful and thick. Safari is shy, but George is making great progress with her and she loves to be petted and brushed, but on her own terms. Sometimes she still runs under something when you want to pick her up. I guess that is a girl's prerogative. 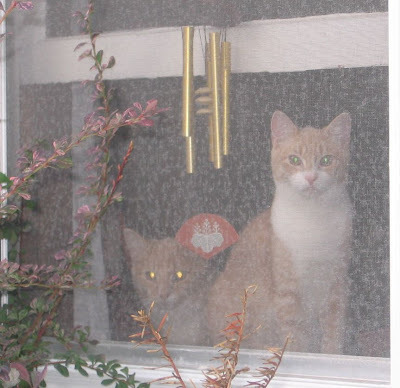 They wait for us in the window when we come home. 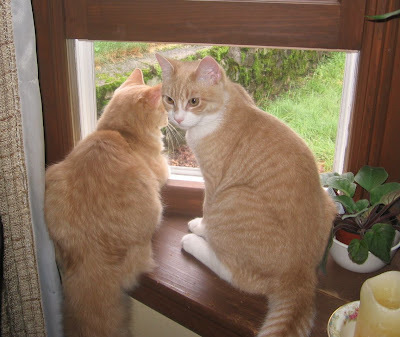 Simba stays in the window, and Safari always comes and stands by the door. When we open the door, we know she will be right there. They are lovely and polite kittens. 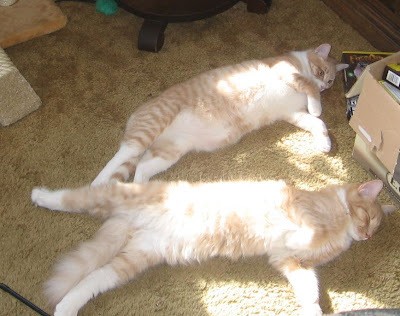 They do their kitten thing, but they don't seem to get into trouble. They don't knock things off shelves or eat jewelry or do destructive things. They are charming and beautiful. How lucky we are. Sometimes you see things that you just have to have! Today I bought these lampwork beads. I can't tell you why I found them so beautiful, but I just had to have them. Aren't they interesting? 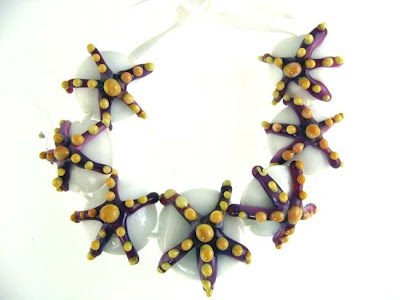 This Etsy seller really knows how to make beautiful beads. You can find her work at PatriciaLubin.etsy.com. Wow! Today I was going to put a couple of links from Google Reader on my web site. The top four things I wanted to share were in video format. I have come to hate that little arrow on a fuzzy screen which means I have to download video on my computer to read a little news. I would much prefer a simple well written story about the folks coming back to New Orleans after the hurricane that watch some guy up on a tower fixing power lines and calling that news. Maybe I'm old fashioned, but when I see that video screen on my computer I just cringe. The TV news is bad enough. What happened to "All the news that is fit to print?" from the good old NYT?